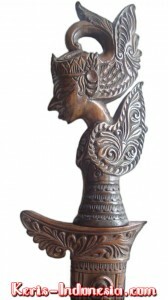 The pedang Gatotkaca is made in the nineteenth century in Lombok/Bali, Indonesia. With a length of only thirty centimeters, this is a relatively short bladed sword. The blade of this pedang features the pamor Nyanak pattern. This pamor pattern is sometimes also called ‘pamor Sanak’. Due to the low contrast, this pamor motif can not be seen very clearly. But when touching the surface of the blade with one’s fingers, its structure can nonetheless still be felt quite easily. The hilt (‘ukiran’) of the pedang represents the mythical character Gatotkaca (Sanskrit: Ghaṭōtkaca) from the Mahābhārata epic. The name Ghaṭōtkaca means ‘hairless pot’ in Sanskrit (ghaṭam: pot; utkaca: hairless), which refers to Gatotkaca’s bald head. However, in the Indonesian version of the Mahābhārata, Gatotkaca’s parents – Bima (Sanskrit: Bhīma) and Dewi Arimbi (Sanskrit: Devi Hiḍimbi) – named their son Jabang Tetuko. And although Gatotkaca plays only a minor role in the Indian version of the Mahābhārata, yet he is one of the most popular heroes in the traditional Javanese shadowplay (‘wayang purwa’). Gatotkaca is a semi-rākṣasa (Sanskrit: demon, giant) who possesses various supernatural powers; he can, for instance, fly through the sky, and has superhuman fighting skills. Besides being a fearless warrior, Gatotkaca is generally also known to be very loyal and extremely courteous, for he greatly respects his elders. Hence, it is said, that the owner of this pedang shall be bestowed with the gracious blessings of Gatotkaca, and will also be protected by his magical powers.